This methodological article discusses practice theories as potential interpretive frameworks to study one of the key areas of Consumer Culture Theory (CCT), which is marketplace cultures and communities. There are already some insightful contributions using practice theories within this area, but there is also a lot more potential to develop theory. The paper summarizes these key contributions, integrates previous research on practice theories and presents some key challenges to these approaches related to their multifaceted, routine, contextualized, dynamic and relational, anti-individualist and material nature. 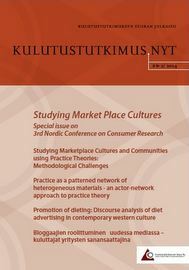 By identifying some of the key methodological challenges unique to practice theories, the paper suggests possible solutions for consumer researchers who wish to expand theory on marketplace cultures and communities. The actor-network theory has received growing interest amongst consumer researchers. This article proposes that the material-semiotic approach of actor-network theory (ANT) can be used to widen and redirect the scope of practice research. While recognizing the two theories as intertwined, it is suggested that the ANT framework can open new avenues in practice research in three ways. Firstly, the ANT conception of agency recognizes the substantial role of material relations directing attention on material agency. Secondly, the conceptualization of actor-network moves the focus from micro-level social practices to a wider network of relations. Methodologically, adopting the ANT guideline of following the actor can help to answer recent calls for embedding consumption in to its wider cultural and institutional context. Presenting first a short introduction to the theories of ANT and practice, the paper presents an elaboration on the possibility of conceptualizing practice in an ANT way: as a patterned network of heterogeneous materials. This article discusses weight-loss and body modification phenomena in contemporary society. The purpose of this study is to analyze the kinds of arguments used when trying to appeal to customers in weight-loss products’ and services’ advertisements in current Western culture. The weight-loss phenomenon is seen as shaping and developing in the interaction between people, in culture and in social formations. The empirical research data was collected from magazines, which deal with three different themes relating to weight control. The data was examined using the discourse analysis method. The results indicate seven appeal types (discourses) from weight control advertisements and the discussion highlights the cultural aspects associated with them. This study suggests that advertising is not only cultural speech but that it also recognises and addresses the individual consumer with whom it is having a dialogue. Yritysten hyödyntäessä yksityishenkilöiden blogeja markkinointiviestinnässään ajautuvat itse blogien kirjoittajat eriskummalliseen kaksoisrooliin kuluttajamarkkinoijina. Tässä artikkelissa perehdytään siihen, millaisia roolipositioita erityisesti muoti- ja tyyliblogien kirjoittajille syntyy markkinointiviestinnässä. Heille esitellään tutkimuksessa tunnistettavien roolipositioiden muodossa kuvaus bloggaajien asemoitumisesta osaksi yritysten ja kuluttajien vuoropuhelua. Ymmärrys bloggaajien asemoitumisesta tähän vuoropuheluun rakentuu teoreettisen, markkinoinnin näkökulmaa painottavan viitekehyksen sekä empiirisen, blogien kirjoittajien näkökulmaa esiintuovan tutkimuksen myötä. Artikkelissa esitettävä tyypittely bloggaajille markkinoinnissa muodostuvista mahdollisista roolipositioista tiivistyy kuvaukseen, jossa esille nousevat niin teoreettiset kuin empiirisetkin roolipositiot sekä niiden leikkauskohdissa muodostuvat kuvausta täydentävät roolipositiot. Näin luotu yksinkertaistettu kuvaus heijastaa moninaista todellisuutta, jossa blogien kirjoittajat liikkuvat sulavasti roolipositiosta toiseen kontekstin vaihdellessa. Tutkimus luo ymmärryksen verrattain uudesta ilmiökentästä paljastaessaan sen rakenteita ja nostaa vuorovaikutteisen internetin valtaistaman kuluttajan näkökulman keskeisenä teemana mukaan digitaalisen markkinoinnin ja viestinnän keskusteluun. The volume Finnish Consumption – An emerging consumer society between East and West edited by Visa Heinonen and Matti Peltonen comprises eight articles along with an introduction and afterword dealing with the question of how the consumer society in Finland has evolved during the XXth century, particularly in the second half. The common thread of all the articles and the main idea of the volume are to approach the rise of consumer society in Finland from the standpoint of an intersection between Western and Eastern influences.